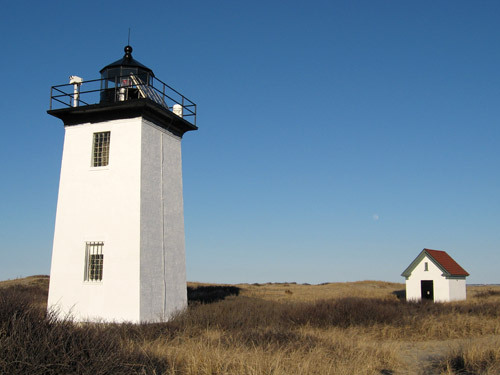 The Cape Cod Chapter of the American Lighthouse Foundation, known for their superb job with the restoration and utilization of Race Point Light over the years, also serves as caretaker for the Cape’s Wood End and Long Point lights. The stewardship responsibilities for maintaining all the three lighthouses on the shifting sands of Cape Cod is no easy task and in many ways, is as challenging as caring for offshore island light stations. Status: Active aid to navigation owned by the U.S. Coast Guard and licensed to the American Lighthouse Foundation. The Cape Cod Chapter – a chapter of the American Lighthouse Foundation, is dedicated to restoring the historic lighthouse. The lighthouse was built in 1872, along with a 1 ½ story dwelling for the keeper. The light tower was originally painted brown and was outfitted with a fifth order Fresnel lens that a flashing red light that was visible 11 nautical miles. Improvements to the light station included the construction of a new wooden keeper’s house, storage shed and oil house in 1896. A fog bell and bell tower were added to the station in 1902. The outbuildings at the light station were removed when the lighthouse was automated in 1961. Wood End Lighthouse is not currently open to the public.